1. One of the twenty-four antique columns of the Church of St. Paul outside the walls of Rome. 2. Another column from the same, executed at the time of foundation or enlargement of the church; it has much less elegance than the antique column, no. 1, although of the same dimensions, and used with it. See 5/3; and 7/1, 2. 3. This column is from one of the side arches of the same church, and has upon its base the name of Pope Siricius, who occupied the papal chair in the fourth century. 4. This coulmn, still further removed from the antique, is from the Church of St. Apollinarius at Ravenna. The base and capital are on the following plate; the plan and section of the church, 17/17-22. 5. Similar column from the same. 6. Column from the Church of Sta. Sophia, Constantinople. 7. Column from the Cathedral of Parenzo. 8. Column from the ground floor of the Church of St. Viatli, Ravenna. 9. Column of the upper gallery of the Church of St. Vitali, Ravenna. 10. Column in the center of the windows of the dome of the church, etc. 11. Column from the Church of Sta. Julia near Bergano. 12. Column from the Church of St. Michael, Pavia. 13. Column from the Church of St. John, at the Porta Latina, Rome. 14. Column from the Church of St. Sabas at Rome. 15. Column from the Cathedral of Cordova. 16. Column from the Cathedral of Torcello. 17. Column from the Cathedral of Pola, Istria. 18. Column from the interior of the Church of St. Mark, Venice. 19. Column, octagonal in plan, from the same. 20. 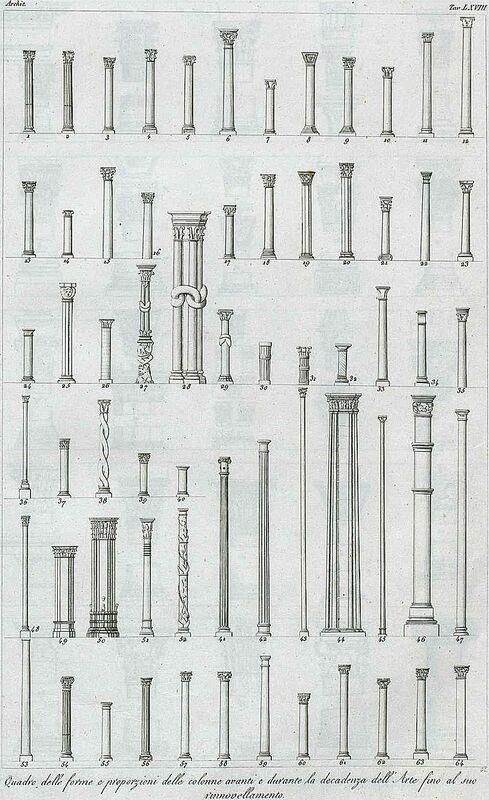 Column, of analogous form, from the small antique temple in the valley of the Nymph Egeria near Rome. 21. Column from the Church of St. Syriac, Cathedral of Ancona. 22. Column from the House of Pilate, Rome. 23. Column from the Cathedral of Pisa. 24-26. Columns from the cloisters of the Church of St. Stephen at Bologna. 27. Column from the Cathedral of Ferrera. 28. Column from the Cathedral of Modena. 29. Similar column from a Greek manuscript of the ninth century. 32. Column from the ancient cloister of the Abbey of St. Vincent and St. Anastasius. 33. Column from the Church of Chiaravalle. 34. Column of the cloister of the Church of St. Laurence, Rome. 35. Column from a building at Venice called il Fondaco de' Turchi. 36. Column from the upper church of St. Francis at Assisi. 37-38. Columns from the cloister of the Church of St. Paul outside the walls of Rome. 39-40. Columns from the Church of St. Flavian near Montefiascone. 41. Column from an ancient painting at Herculaneum. 42. Column from one of the chapels of the Cathedral of Upsala, Sweden. 43. Column from the Cathedral of Paris. 44. Column from the Church of Modling, built by the templars in the fourteenth century, at two leagues from Vienna. 45. Column from Ely Cathedral. 46. Column from the Cathedral of Toledo. 47. Column from the interior of the Cathedral of Milan. 48. Column from the Church of Sta. Maria Novella at Florence. 49. Corinthian pilaster from the Church of Sta. Maria del fiore at Florence. 50. Column from the Loggia or Portico de' Lanzi at Florence. 51. Column from the Alhambra at Granada in Spain. 52. Column of a painting at Herculaneum. 53. Column from the Church of Sta. Maria sopra Minerva. 54. Column from the Church of St. Ornofrio at Rome. 55. Column from the Library at Cesena. 56. Column from the Cathedral of Mantua. 57. Column from the Church of St. Laurence at Florence, by Brunelleschi. 58. Column from the interior court of the Palace of St. Mark of Venice, at Rome by Baccio Pintelli. 59. Column from the Church of Sta. Maria del Popolo, Rome, by Baccio Pintelli. 60. Column from the stage of an ancient theater at Velletri. 61. Column from the Church of St. Augustine, Rome, by Baccio Pintelli. 62. Spiral staircase by Bramante at the Belvedere at the Vatican. 63. Corinthian column from the interior of the Church of St. Peter by Michael Angelo. 64. Corinthian pilasters from the exterior of the Church of S. Peter.